BMW G 310 R price starts at Rs.2.99 lakh (Ex-Showroom, Delhi). G310R sports a 313cc single-cylinder liquid cooled unit that produces 34PS at 9500rpm and 28Nm of torque at 7500rpm. To ensure efficient burning of fuel, BMW has twisted the cylinder head around by 180 degrees thereby allowing a straight path for the fuel and air mixture. This change in the architecture has also given the bike a lower centre of gravity for increased confidence over corners. The G310R tips the scale at 158.5kg. 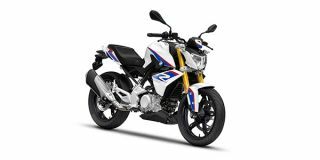 BMW claims a top speed of 143kmph and combined fuel efficiency of 30kmpl for the G 310 R. The bike gets a tubular steel frame with 43mm upside-down front forks and rea r monoshock damper. It gets 17-inch alloys wrapped in 110/70 R17 front and 150/60 R17 rear Michelin Pilot Street radial tyres. Braking is via a single 300mm front disc clamped with radially mounted calipers and a 240mm rear disc. It gets dual-channel ABS as standard.